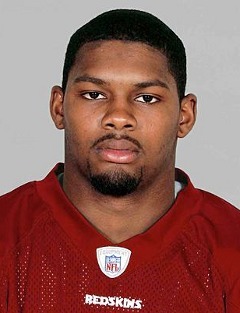 Fifth pick in the 2004 NFL draft, nicknamed "Meast" (man+beast) by his teammates. In 2006 Taylor pled no contest to two misdemeanor charges (reduced from felony), stemming from a weapons incident the previous year. For this he received 18 months probation, community service, and paid $10,000 in community restitution. During an apparent robbery of his home in November 2007, Taylor defended his family with a machete but was shot in the leg, an injury severing his femoral artery. He was airlifted to Jackson Memorial Hospital in Miami, and subsequently entered a coma from which he never recovered. Jackson Memorial Hospital, Miami, FL.